I was never one of those people who believed in the importance of taking time for self-care. There were always the kids through high school and university who really invested time in themselves – whether it be practicing mindfulness, meditating, attending a yoga class, or simply ensuring that they weren’t trying to do a million things at once. While cramming for exams, smashing out semester-long projects, playing netball, working, and being social for so many years I began to think I was invincible. That was until I started full-time work. Turns out, when you’re running on all six cylinders, you hit burnout pretty fast. For someone who was always the first to put her hand up for fun, to have a laugh, it came as a bit of a shock to my immediate circle of family and friends when I started to become uncharacteristically introverted. I’m not going to say meditation saved my life, or that it is for everyone, but, that coupled with some other tweaks to my general lifestyle, really was my saving grace. ‘Mindfulness’ as a movement was beginning to crop up in all the media I consumed – and as I work in media I watch and read a lot of news! I thought to myself, ‘I need this’ – but where to start? Around this time last year, just before the Easter break, I sat down with my mum and knew I had to make some changes. Things needed to shift and I needed to place greater importance on some areas of my life – my mental health being one of them. Right smack bang in the middle of our holiday, I sat down on the floor of my room and mapped out the positives and negatives in my life (corny, but seriously, writing it all out helps). It was a mixture of letting go of friendships that no longer helped me grow, investing time into my work and rewarding myself with downtime at other times during the week. I went from playing netball five times a week, to only two – and instead incorporating a yoga practice to my routine. 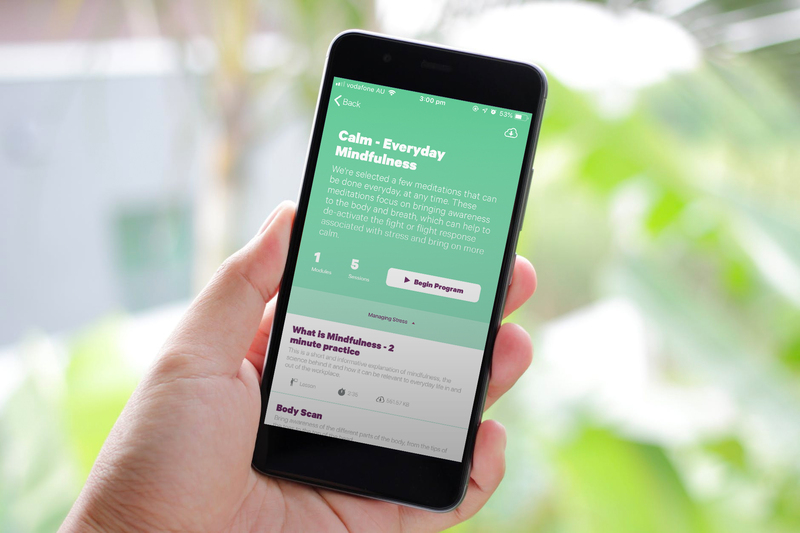 Smiling Mind was the next step – as a free app, I’d been told (and read) that the guided meditations provided a great foundation for a daily meditation practice. Anyone speaking on my behalf will gladly tell you I have the attention span of a goldfish. So, the thought of meditating for long periods of time was never going to work for me. Instead I opted for an achievable goal of 10 minutes per day – after all if I could spend an hour doing bugger all on Instagram, surely I could set aside a sixth of that time for the betterment of myself. Now’s the part where I say, ‘and that’s how meditating revamped my positive outlook on life, and why I’m so relaxed and better equipped to deal with stress…’ But I don’t want to paint a false picture of my road to self-acceptance. At the start it was really hard. Trying to sit still and focus my thoughts for 10 minutes – without thinking of my ever-growing to do list, and what I was going to eat for dinner – is really tricky. But with time, I eventually got there. I was kind to myself and tried not to chastise myself for having a wandering mind – we’re human, turns out it’s normal. I meditate in the mornings, but that’s not to say you have to as well. I’ve been meditating for a year now – daily 10-minute sessions – and I can’t begin to explain how much it’s helped me. From the outside you may not take me for the meditating type – I’m loud, vibrant and excitable (a bit full on according to some of my workmates and friends!) – but I now know when to switch off and treat myself to some calm. If you’re reading this and my story resonates with you at all, try using the Smiling Mind app. Your body and soul might just thank you for it.